The Global Down Syndrome Foundation is a public non-profit 501©(3) dedicated to significantly improving the lives of people with Down syndrome through Research, Medical care, Education and Advocacy. Formally established in 2009, the Foundation’s primary focus is to support the Linda Crnic Institute for Down Syndrome, the first academic home in the United States committed solely to research and medical care for people with Down syndrome. Since Down syndrome is the least-funded genetic condition in the United States, fundraising and government advocacy to correct the alarming disparity of national funding for people with Down syndrome is a major goal. 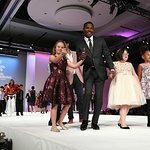 The Global Down Syndrome Foundation hosts the single-largest fundraiser in the U.S. for people with Down syndrome: the Be Beautiful Be Yourself Fashion Show in Denver, featuring models with Down syndrome walking the runway with celebrities, sports figures and government officials. The event also includes the presentation of the Quincy Jones Exceptional Advocacy Award to those who have championed people who are differently-abled in categories such as humanitarian work, self-advocacy, and public service. Recipients include Quincy Jones, Jamie Foxx, Kyra Phillips, John C. McGinley, Karen Gaffney, Sujeet Desai and more. Information about sponsorships and tickets is available at www.BeBeautifulBeYourself.org. Global also hosts the Be Beautiful Be Yourself Gala in Washington, DC, honoring members of Congress for their advocacy and celebrating models with Down syndrome. Donations to the Global Down Syndrome Foundation can be made at www.globaldownsyndrome.org/donate. Google trends for "Global Down Syndrome Foundation"
We don't have any videos related to Global Down Syndrome Foundation.